Sharjah: Members of Sajaya Young Ladies of Sharjah participated in Sharjah International Children’s Film Festival in the 23rd of October and the 25th of October 2016. Through its participation, Sajaya aims to expand the skillsets of youngsters through a workshop that introduces them to the techniques of cinematic makeup. This involvement is part of Sajaya’s commitment to take part in major local events, diversify its training and general activities and give young ladies the opportunity to showcase their creativity. Thirty-eight young ladies from different branches of Sajaya participated in the opening ceremony of the festival. This engagement is of paramount importance for girls as it helps develop their cognitive abilities, increases their awareness and introduces them to the techniques of modern arts that will help them develop their creative skills for future innovations. Furthermore, by participating in this event, Sajaya helped to promote and cultivate the girls’ hidden talents. On the third day of the festival, Amal Al Muaini, a leading personality who graduated from Sajaya, presented the cinema makeup workshop. The workshop aimed to coach children on the different techniques of cinema makeup – a technique that has become very popular in recent years. The workshops focused on characters inspired from global films. 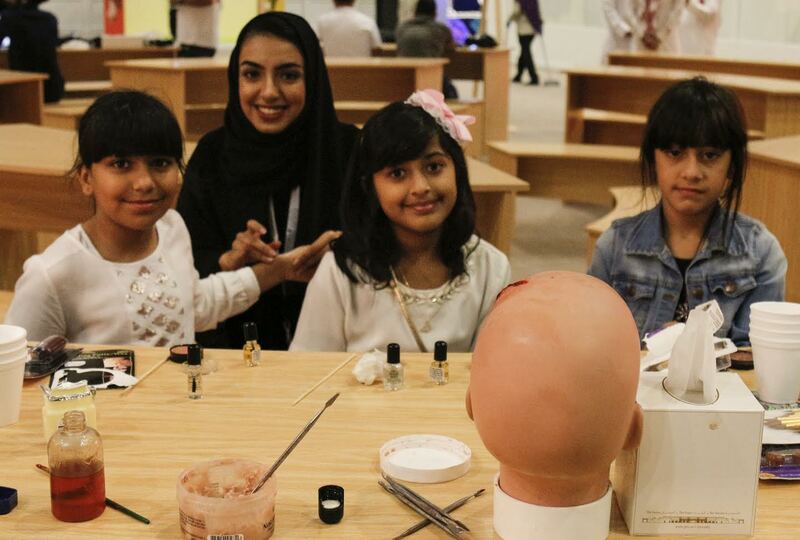 HE Al Qasimi added that the cinema makeup workshop aims to support Sajaya’s members and graduates. “Such workshops will help develop their social and personal skills. Sajaya strives to promote the talents of its members so that they can be role models in their community,” she concluded. Sajaya Young Ladies of Sharjah is a leading organization dedicated to nurturing talented young girls between the ages of 12 and 18 years in various fields of creativity. It was originally founded in 2004 under the umbrella of the Supreme Council for Family Affairs as a subsidiary department of the Sharjah Children Centers. In 2012, it was declared as an independent body by virtue of an administrative decision issued by HH Sheikha Jawaher bint Mohammed Al Qasimi, wife of His Highness the Ruler of Sharjah and Chairperson of the Supreme Council for Family Affairs, in order to harness all available resources for young women who embody hope for both the present and the future.